Architectural Visualization made for Unreal Engine 4.18. 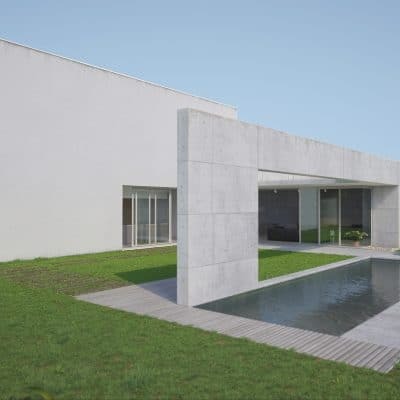 Modern Country House is an architectural visualization project made in Unreal Engine 4. This is an elaborated project with a lot of furniture, assets and examples of realistic lightning setup. It comes with lots of blueprints examples: turn fire on/off, change colors, materials and assets. The user interface is made using UMG. The demo is running at 60FPS on a GeForce GTX 780. Control character with WASD keyboard keys or analog joystick controls All the interactions are made when the objects are highlighted. Press Right mouse button to open User Interface for change colors/materials/assets. Press Right mouse button to turn on/off fire. Press “M” to menu. Press Face Button Left, Face Button Top and Face Button Right to chage colors/materials/assets. Press Face Button Left to turn on fire Press Face Button Bottom to turn off fire OBS: To change the floor material you need to look down. The demo is running at 60FPS on a GeForce GTX 780. File format: compressed in .RAR. The license of this project is non-exclusive, non-transferable, and non-sublicenseable. Materials, assets and examples can be used in commercial projects but the complete project cannot be used without modifications. See the complete license here. Observation: One or more textures on this 3D model have been created with images from CGTextures.com. These images may not be redistributed by default, please visit www.cgtextures.com for more information. I like the menue because it is so simple and intuitive. Only 3 choices, that’s good. And the graphic quality is georgeos. Great project! Nicely done, paying attention in details. Hello Harry, this demo is not made for HTC Vive, is not optimized and don’t have the controls. Regards! is this project compatible with Unreal Engine 4.11 or 4.12? Hi! Do you already have the HTC Vive version? If not, do you think i can use it anyway within the UE4 4.14 VR template? Architectural Visualization made for Unreal Engine 4.18. Riviera House is an architectural visualization project made in Unreal Engine 4. If I were to build a house for sure this would be one of the main inspirations: a house with modern design, a fantastic portico, pool and deck, excellent garage, a pool view kitchen and a beautiful living room. This project had the challenge of creating a lightning that worked well for internal and external area of the house, and the creation of a functional display system. Also there is a little bonus: exchange of facade materials and functional TV! It comes with a lot of furniture, assets and examples of realistic lightning setup. Studio visualization made for Unreal Engine 4.20. The Studio visualization simulates a studio lightning with infinite background for small, medium and large objects.